With the snow beginning to fall and the anglers retreating to their couches, WFN: World Fishing Network, North America's only 24-hour fishing lifestyle network, is bringing new seasons of six favorites, as well as two new shows in January that are sure to reel in viewers. Old favorites such as Lindner's Fishing Edge, Musky Hunter (Season 6) and The New Fly Fisher (Season 7) return along with the debut of Water & Woods and Adventures South of the Border. For a schedule and more information, visit www.WorldFishingNetwork.com/tv/schedule.aspx. As WFN viewers know, we strive to provide a diverse programming schedule, and our January line-up is no exception," said Corey Russell, Vice President of Programming for WFN. "The diversity of our shows guarantees that all types of anglers - from novices to experts and fresh to saltwater enthusiasts, and everyone in between, will be entertained and educated all month long." Jan. 3 -- The New Fly Fisher (Tuesday, 9:30 p.m.): Hosts Bill Spicer, Colin McKeown, and Philip Rowley, offer viewers, with the help of special guests, an educational and instructional experience for fly-fishers. Using concise instruction, animation, and underwater videography, they take a three-dimensional approach to fly-fishing education in this season's 26 episodes. Jan. 5 -- Big City Fishing (Thursday, 7:00 p.m.): Host Amanda Plewes visits cities across North America discovering new and adventurous shore fishing locations. Plewes focuses on the "how-to" and "where-to," offering insight into bait selection, shore fishing tactics, equipment, and environmental issues. Featuring exact fishing locations in the city, Plewers helps give viewers become successful anglers close to home. Jan. 6 -- Lindner's Fishing Edge (Friday, 8:00 p.m.): Al Lindner, considered one of the world's best all-around anglers, demonstrates and teaches viewers how to catch freshwater fish. With the goal of teaching how to catch more and bigger fish, Lindner offers tips for catching a variety of species such as bass, crappie, trout, walleye, musky, and northern pike. Jan. 6 - The Next Bite (Friday, 8:30 p.m.): The Next Bite crew spans North America on the lookout for walleye and musky. Gary Parsons, Keith Kavajecz, and Pete Maina offer lessons on tools that will develop viewer's skills - such as hooking and landing, jigging in heavy current, and using the latest fish-finding technology. Focusing on natural lakes, Parson and crew are always on the lookout for "Fish with Teeth"! 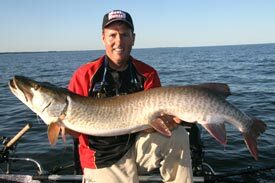 Jan 6 -- Musky Hunter (Friday, 9:00 p.m.): The first ever show solely dedicated to the musky, expert Jim Saric covers everything from the basics for beginners, to strategies and tips for those who have been chasing the musky for years. Saric, a legendary musky angler and editor of Musky Hunter magazine, is joined throughout the series by other popular musky anglers, trying to find the hard-to-catch musky. Jan 7. - NEW SHOW -- Water & Woods (Saturday, 4:00 p.m.): John Gillespie, a self-proclaimed "average angler," is taken on trips with some of the biggest names in fishing in the Midwest and Canada. Gillespie's energy and enthusiasm will entertain viewers as he and an expert search for big fish. Airing within 10-days of filming, Gillespie also offers a current news source for the fishing industry. Jan 7. -- Australian Fishing Championships (Saturday, 8:00 p.m.): Featuring anglers from Australia's ABT circuit, four teams fight for the Championship as they search for bream, bass and barramundi. Hosts Steve Starling, Adam Royter, and Darrly Beattie follow the teams around Australia as they search for the winning catch. Jan. 15 -- NEW SHOW -- Adventures South of the Border (Sunday, 5:30 p.m.): Set in Baja Sur, Mexico, Mike "The Griz" finds the best saltwater fishing grounds in Mexico. Along with his son Charles, "The Griz" explores the Southern regions of Baja California, presenting the skills needed for deep-water fishing. For more information on WFN programming, click here.